Golden Villas are equipped with everything you need for a perfect stay! Golden Villas consists of eight spacious and comfortable apartments of attractive, contemporary design. 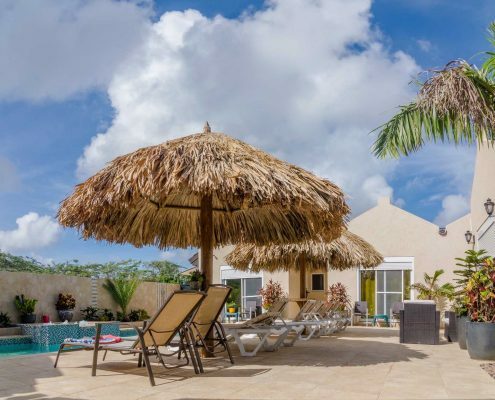 Ideally located near Aruba's most beautiful and popular beaches. We are conveniently close to the island's best markets, malls and nightlife. Our cozy facility and genuine hospitality provide the luxury and ambience you desire, at very moderate rates. Why stay in a bare-bones hotel room when you can make yourself at home at half the price? Your hosts, Ricard & Bel, lives on premises, and are available at anytime to see to your needs. They are a delightful element of the ambiance of Golden Villas, where you are always a treasured guest, not just a customer. Do not hesitate to ask their advice regarding dining, shopping, entertainment and activities, they relishes the opportunity to insure you have the most memorable vacation possible. It is no wonder that in the two years Golden Villas has been welcoming vacationers, they have established a very loyal clientele. “WHAT A PERFECT INTIMATE SPOT” Well located in Noord, just slightly inland from beaches, restaurants, ATM machines, low rise & hi rise hotels The newest supermarket on the island, SUPERFOOD is a short drive. Car is a MUST & parking is conveniently located just out front of the entrance gate to Golden Villas. A very cozy place with the best service and excellent location. All you need for a great vacation in Aruba and feel at home. The host of the place is A1. When we return to Aruba, Golden Villas will be our first choice. We Stayed at Golden Villas from the June 12 - 17,The Place is Welcoming and the Staff (Owners Bel & Ricard) and the housekeeping Santa are very Helpful and friendly. Most Importantly the Rooms are Clean and very affordable for what you get for. Location is Great and quiet. 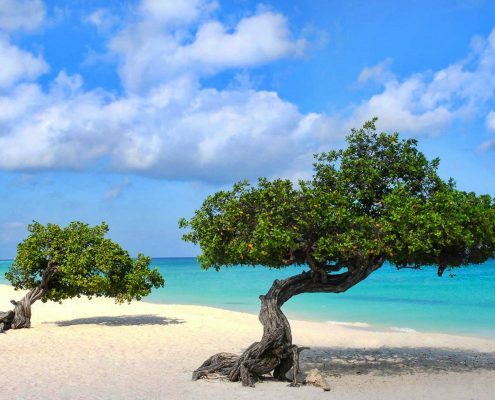 We highly recommend staying here if you plan a trip to Aruba. Thanks a lot.... We really felt like home,they couldn't done more for Us!! 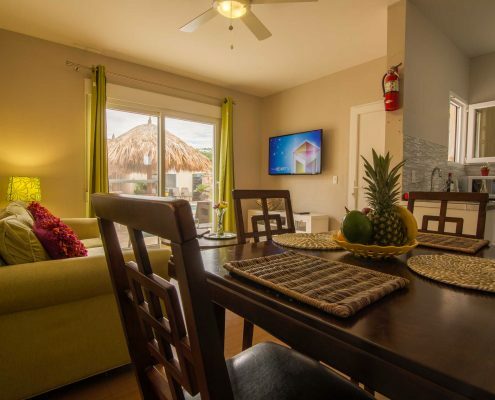 My husband and I visited Aruba for the first time and spotted the Golden Villas on VRBO and looked at the reviews on TripAdvisor so I decided to book it. My husband (who doesn't do reviews) reminded me to give this place a 5 Star review. Not only did the apartment look exactly like the pictures but Ricard was just the nicest person you could ever meet. I stayed twice and I already know that I will keep coming back. Really nice place. Very clean apartments, fully equipped with all you need in the kitchen. Nice furnished and very comfortable and quiet. I love the modern interior and the beautiful pool. The way all is built, is with quality and privacy in mind. You feel safe as all is well secured. The owners (Ricard en Bella) are very friendly and service-minded. I have been staying at the Golden Villas for several years now. The apartments are Clean, safe, comfortable,close to Food shopping, laundry,beaches, and restaurants. You will however need a car. The owners are outstanding. And they live on the property. This insures a quiet, restful environment., which can not be underestimated. Great villas, friendly management and sales department. Even gate security staff had a very friendly attitude. The stay was awesome! The homes were nice, well kept and the area is quiet. Just minutes from the beach. My trip was with a group of friends and we had a total of 2 villas during our stay. We absolutely loved them all. A minha viagem para Aruba, se tornou ainda melhor por ter escolhido para me hospedar , um lugar tão bom e dirigido por pessoas tão gentis e competentes quanto o Ricardo e sua esposa. Os apartamentos são espetaculares, muito bem equipados, te fazendo sentir realmente que fez a escolha certa. Tão certa que retornarei e com certeza ficarei novamente lá . Posso até dizer que deixei lá , mais que um proprietário , mas um amigo. Quando viajamos e nos sentimos como se tivéssemos em casa, é mais que perfeito. Stayed here for 9 days and it was worth every penny. Awesome isolated place away from pesky tourists. Close to restaurants, a bank, supermarket if you want to cook in the kitchen, and of course beaches. Host Ricard is the best! Would definitely stay again on our next visit. Shared this apartment with a friend for 6 days and I have to say we were totally impressed with everything. Our hosts Ricard and Belle work nonstop to see that everything is to your liking. Everything is in brand new condition, and extremely clean, both in and out. The door & windows are both room darkening , and very sound proof. The A/C worked great, and the water pressure was fantastic. Thank You for running a super establishment. We will be returning for sure ! Cathy S Centereach, New York. USA. Very nice apartments, we were here with friends from Croatia and we booked 3 apartments, beds r comfortable and owners r very kind and helpful, terrace and swimming pool are clean and new, area is not so nice like the apartment but it's safe and not so far from the beach! We were beyond impressed with Golden Villas. The apartments are contemporary, spotless and kitted out with Hamilton Beach blenders, Cuisinart coffee makers, black-out blinds (for even the most notorious insomniac), a gorgeous limestone shower (with HOT water, a rarity with most island stays) and NETFLIX even. And there's never a battle over outdoor lounge chairs! With just eight private villas surrounding the courtyard and pool, the experience is intimate and private. It's a far cry from the obnoxious crowds at all-inclusives and the blaring poolside music. Here, you can watch parakeets fly-by and spend most of your hours without seeing anyone else. Owner Ricard and his family have a special way of making their guests feel at home. We stayed here a week and then moved to the Marriott Ocean Club. The only thing there that was better was being on the beach. However, the beach is not far from Golden Villas. Several very good restaurants are nearby. At Golden Villas there is no need to scramble in the early morning to claim a lounge chair by the pool. It is lovely, spacious, uncrowded, and quiet. We look forward to a return trip. Paul R Upper Tract, West Virginia. USA. This place exceeded our expectations. Apartment was very clean and the place is beautiful. There was fully equipped kitchen, beds were comfortable and the whole place is furnished with good taste. The owners are super friendly and made us feel right at home. There are lot of good restaurants (and supermarkets as well) nearby which you can reach also by feet. Highly recommended - we really did enjoy our stay. En cuanto al servicio recibido fue excelente! desde el recibimiento por sus propios dueños (Ricard e Isabel) y resto del personal quienes son muy amables y atentos, hasta los servicios dentro del alojamiento (luz, AA, Wi fi, canal por cable) disponibles en todo momento, excepto en los momentos de lluvia (DIRECTV TV por cable satelital). Villas cien por ciento recomendadas en todos los aspecto. Son cómodas con intalaciones adecuadas , ambiente familiar, céntrico y tranquilo. Y todo acompañado de sus excelentes anfitriones. Con seguridad cuando vuelva escogería nuevamente Golden Villas Aruba y lo recomendaría a todo el que pregunté. Gli appartamenti sono in una posizione perfetta, sono nuovi, pulitissimi e forniti di tutto (ci sono persino le sedie e la borsafrigo da portare in spiaggia). Il proprietario Ricardo è gentilissimo e disponibile a fornirvi tutti i consigli e le indicazioni, oltre a darvi la possibilità di prenotare tramite lui tutti i tour senza alcun sovrapprezzo. Non possiamo che consigliare vivamente golden villas a tutti coloro che cercano una soluzione alternativa all'hotel! Grazie Ricardo!!!!! Los apartamentos son fantásticos, estan muy bien equipados y disponen de todas las comodidades. La zona es tranquila y está cerca de supermercados, tiendas y restaurantes, etc. Los dueños son encantadores, muy atentos y dispuestos siempre a facilitarte las cosas. Estuvimos una semana en Golden Villas, y si volvemos a Aruba nos volveremos a alojar a aquí seguro!!! Wir fanden die Golden Villas eher zufällig, aber das war wie ein Lottogewinn! Die kleine Anlage ist einfach perfekt für einen entspannten Aufenthalt in Aruba. Der freundliche Betreiber Ricard hat hier ein kleines Paradies geschaffen. Die Lage macht zwar einen Mietwagen erforderlich, aber den sollte man auf Aruba ohnehin nehmen, um die Insel auf eigene Faust zu erkunden. Parkplätze gibt es direkt am Haus. Fuimos 8 noches en mayo pasado,cuatro amigas y esutvimos alojadas en estos buenisimos departamentos atendidos por sus dueños,una pareja catalana siempre dispuesta a ayudarte en lo que se necesite,recomiendo altamente este lugar para hospedarse equipado con todo lo absolutamente necesario para pasar unas vacaciones increibles. Un lugar útil que da facilidades como cocina, sillas de playa, refrigeradora, microondas. Adicional un congelador para llevar cervezas a la playa, muy cómodo con aire acondicionado en todos los espacios recomendando, seguro se regresa. Aruba es un destino costoso, por lo que Golden Villas es una buena opción con excelente relación costo beneficio. Las habitaciones están en muy buen estado, son limpias y bastante amplias. El lugar es atendido por los dueños que son españoles y lo hacen sentir como en casa. Buena conexión de internet, Directv y una linda piscina complementan el sitio. super au calme... mais proche des différents endroits à visiter. les propriétaires sont adorables et à l'écoute de vos envies... le logement est tout à fait splendide et rien à redire. Je le conseil vivement.